The steps involved in replacing the knee begin with making an incision on the front of the knee to allow access to the knee joint. This incision has become shorter now that we use minimally-invasive surgical instruments and techniques. 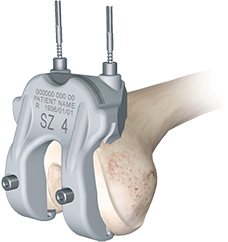 Once the knee joint is entered, a special, customized knee instrumentation device is placed on the end of the femur. This device is used to ensure that the bone is cut in the proper alignment to the leg's original angles, even if the arthritis has made the patient bowlegged or knock-kneed. 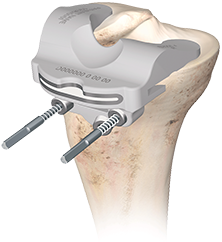 The custom device is used to cut several pieces of bone from the distal femur so the artificial knee can replace the worn surfaces with a metal surface. Attention is turned toward the lower bone, the tibia. 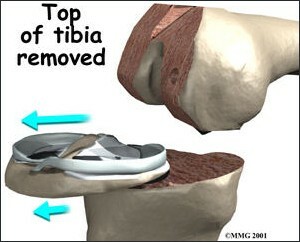 The top of the tibia is cut using another customized knee instrumentation device that ensures the alignment is satisfactory. 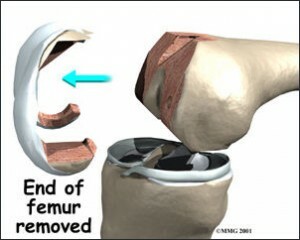 If it is severely damaged, the undersurface of the patella is removed. The metal prosthesis is cut so it matches the taper almost exactly. With an epoxy cement, the component is attached to the end of the femur. The metal tray that will hold the polyethylene spacer is attached to the top of the tibia and is cemented into place. 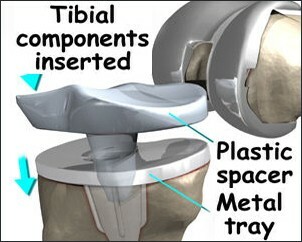 The plastic spacer is then attached to the metal tray of the tibial component. 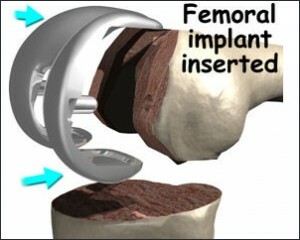 If this component wears out while the rest of the artificial knee is sound, it can be replaced. 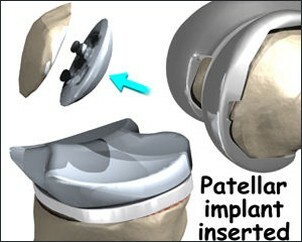 Depending on the degree of arthritis, a patella button is sometimes cemented into place behind the patella. Nylon, or reabsorbable, stitches are used to close the incision. Implant designs vary in important ways to meet the needs of each patient. 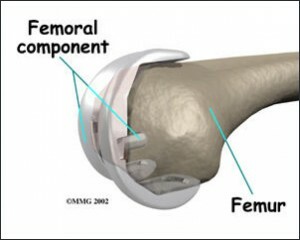 Restoration of normal knee joint function is the goal of knee replacement surgery. 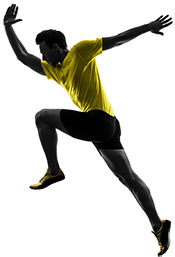 We select the implant based on the patient’s anatomy, degree of looseness of the knee, range of motion, and planned sports activities.